Christmas is always an exciting and busy time of the year for most of us. It’s the joy of holidays, seeing your loved ones, feasting and gift giving. For Cathy from VIC, 2018 was certainly a Christmas she won’t forget! She became the lucky winner of the Act for Kids draw 75 major prize! Cathy was at home having lunch when she received a call from the Act for Kids CEO letting her know she won. 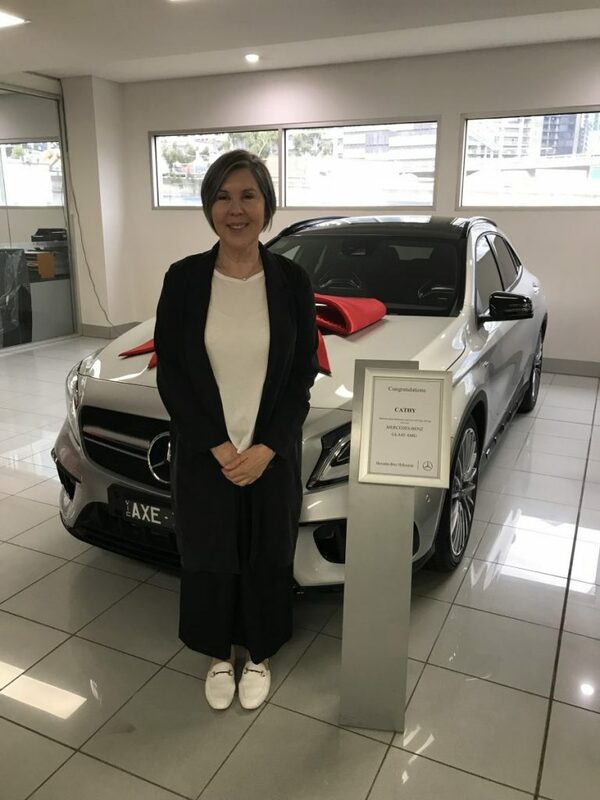 The lucky winner won the choice between two brand new Mercedes-Benz cars valued at $96,109.36 RRP each – a GLA 45 AMG or a C300 Coupe. Cathy chose a Mercedes-Benz GLA45 AMG. Stunned and overwhelmed, Cathy later reflected on how special it felt being the prize winner. Above all, Cathy explained her drive to buy her tickets in the draw. Each ticket helps support Act for Kids and the vital work they do as a charity who assist in treating and preventing child abuse and neglect. Cathy has been a previous supporter of the cause and now, as the winner, she continues to support Act for Kids and its worthy cause. Cathy has 5 children of her own and she said that “the thought of any harm coming to them or any child is awful”. For your chance to win your own Mercedes-Benz, get your tickets in the Act for Kids lottery now. Hurry, limited tickets are available for this draw!